Good Morning! Instant Oatmeal from Max Protein is a delicious and healthy food you should include in your daily diet. Incorporate to your food all the nutritional benefits of this oatmeal, which includes fiber, B vitamins, vegetable proteins and healthy fats. Enjoy its taste in your daily meals. Good Morning! Instant Oatmeal from Max Protein is very tasty and also very nutritious. Renew your food with its wonderful taste! With Good Morning! Instant Oatmeal from Max Protein, you can prepare a myriad of appetizing meals, also with a high nutritional value. With this food simple but very beneficial, you can improve deeply the way your nutrition. It contains very important vitamins and minerals, such as iron, vitamin E and B vitamins, carbohydrates, proteins and fiber. It is a very powerful source of energy and also helps cleanse your system. You can prepare countless recipes with oatmeal, and eat it cold, hot, added to milk or yogurt, with nuts, or even in a really delicious dessert. It is a perfect replacement for traditional flour because this version is much more favorable for your figure and your quality of life. Good Morning! Instant Oatmeal from Max Protein has been processed using an advanced micronization method that improves its dissolution capability and also benefits a fast digestion. Take delight in its delicious taste, which you can enjoy at breakfast, snack and lunch time. This will give you more than enough of energy to start a demanding day. Have a successful training with lasting results, thus ensuring the presence of a reserve of very effective and healthy carbohydrates in your system. This is the food you must eat if you want to balance and reinforce your level of vitamins and minerals. It is perfect to prepare nutritious desserts that will be the delight of your whole family. Good Morning! Instant Oatmeal from Max Protein can be part of your diet in order to help you improve your body build, as it is tasty and but do not make you put on weight. In fact, it keeps your appetite at bay, which in turn will allow you to concentrate on eating healthy foods. Its properties keep you strong, and also help reduce the weight naturally. It enriches the amazing taste of fruit smoothies or shakes, due to it has been sweetened with Splenda and stevia. If you received the recommendation of a professional to add oats to your meals, then be glad because now you have a practical product, you can use without disadvantages. This oatmeal is dissolves easily, plus it is delicious. Therefore, you can make it part of your daily habits and include it in all kinds of meals. It contains fiber, which makes feel satisfied. It is sweetened with Splenda and stevia, so it does not make you put on weight. Its taste is very delicious. It comes micronized in order to be better dissolved and assimilated. It provides a huge amount of nutrients. It was alkalized with PH Regulator. Good Morning! 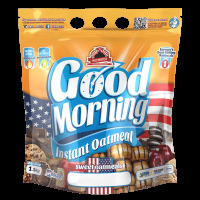 Instant Oatmeal from Max Protein has been micronized to promote its use and also has a really delicious taste. Get a very tasty breakfast that will get you satisfied and will give you energy that lasts throughout the day. It improves your nutrition and your quality of life. Recommended use: preferably, consume dissolved in water, milk or yogurt. You can add it to other foods to taste.